Maribel del Rocío Fernández García (born May 29, 1959) is a Costa Rican actress, who works in Mexico, and currently lives and resides in Miami, Florida. Maribel was elected Miss Costa Rica in 1978, going on to represent her country at the Miss World and Miss Universe contests. The Miss Universe pageant had been held in Acapulco, and she received offers by Televisa producer Sergio Bustamante to develop a career there, but she returned to her country, and months later she accepted, and left her mother and boyfriend. Guardia moved to Mexico in 1980; this move proved to be crucial for her show business career. In 1980, she appeared in her first television show, alongside Manuel "El Loco" Valdés. 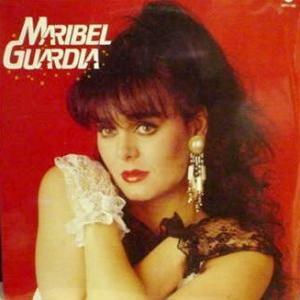 Guardia went on to make multiple telenovelas (soap operas) and release a series of albums in the Norteña music genre. Maribel Guardia has acted alongside some very important actors, including Andrés García, Saul Lisazo, and Joan Sebastian. One of her major soap opera hits was alongside Sebastian. Together, they filmed Tú y yo. One film where she acted alongside Andrés García was Pedro Navaja, where she played the main character's wife. She also did a film that was called El Rey de Los Taxistas alongside Luis de Alba. She and another El Rey de Los Taxistas costar, Aida Pierce, would reteam for the telenovela Serafin. Recently she has done telenovelas made for children. She has also done a comedy in 2006 that is called Que Madre, Tan Padre as well as the variety show, Muévete. In 2007, she was included in the book Televisa Presenta, which commemorated fifty years of network television in Mexico. In 2008 she released a new album, the main single is "De Pecho A Pecho" (From Chest To Chest) written by the Nicaraguan composer, songwriter and singer Hernaldo Zúñiga. Apart from her jobs as an actress and singer, she has also modeled for various calendars and magazines, which are sold to her fans. Since late 2009 she lives in her own residence in Miami Beach at Florida, with her son. For her work in movies, television and as a recording artist, Guardia has been inducted into the Paseo de las Luminarias in Mexico City. In January 2010 she announced that she worked all 2009 in a new studio album, set to be released on February 13, 2010, under EMI Music, titled "Move You On - Muévete", which it contains 12 tracks recorded in Mexico City, Texas & Colombia, 8 tracks are in Spanish language, the other 4 are in English language. Maribel lived five years with Joan Sebastian and had a son with him. 1993: El asesino del zodíaco .... Lisa aka "Un instante para morir"